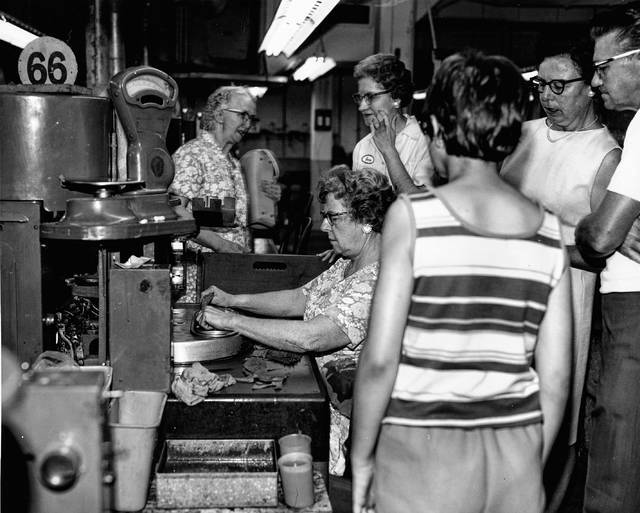 From right, Evelyn Wollum, Maxine Butler, Lillian Hammons and Virginia Rahrig work on the stemming or stripping machines in the 1970s. They would feed a leaf of tobacco into a machine that trimmed out the center stem. 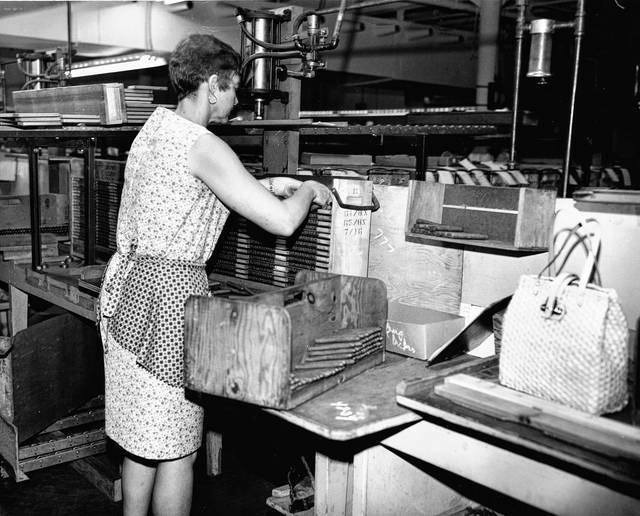 An unidentified worker demonstrates the wrapper layer process. The operator placed a leaf onto a pattern and a die would come down and cut it to the proper shape. 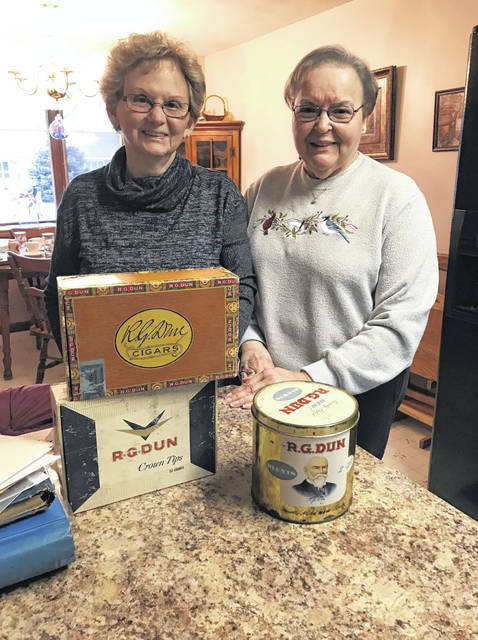 Sola Curtis, left, and Cheryl Wehner pose for a photo with cigar boxes and a tin. The boxes are from the 1950s or ’60s, and the tin dates from before 1968. The man’s likeness is a composite from Dun and Bradstreet ratings. This photo from about 1968 shows the business at 235 N. Main St., its current location. 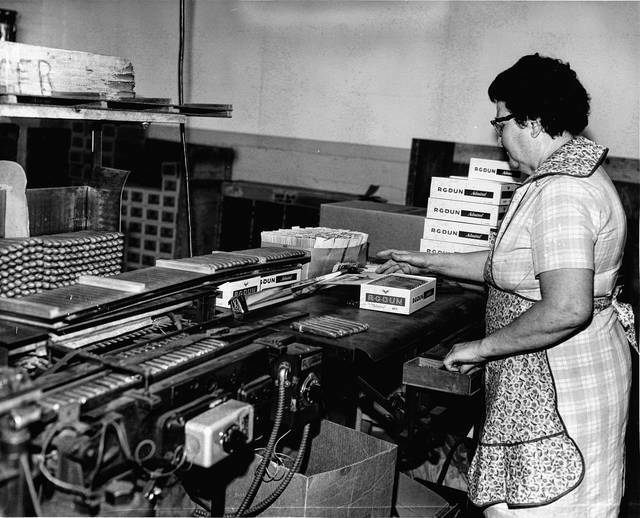 Helen Dunlap operates a cellophane machine in the packing room. Cases of cigars seen behind her are awaiting cellophane. Margaret Schmiedebusch gathers cellophane-wrapped cigars into a box. The next step would be tacking in a small nail to hold the box closed. 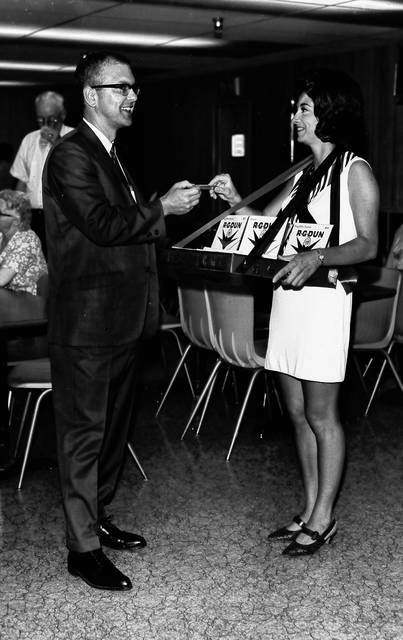 Lima Mayor Christian Morris takes a cigar from Shirley Diller in the cafeteria at 435 N. Main St. during an open house in May 1968. Tobacco hangs in the conditioning room. Wrapper tobacco would need to be rehydrated after it arrived in Lima and spend about a day in this special area to become flexible. Company executives, from left, are Mel Werner, secretary/treasurer; Russ Allen, vice president of sales; Jim Kelch, comptroller; Cliff Mason, president; and Phil Porreca, director of manufacturing and industrial relations. This photo was made in Mason’s office in the 435 N. Main St. building. Note the art over the sofa to the left. It was made by Shirley Diller from tobacco leaves. The sealed work was displayed in the reception area until recently when it began to crumble. This photo was made in 1963 during the grand opening on Bible Road. It is now Dana Corp.
Anne Zimmer packs cigars in the packing room. The box that is shown with her held 300 cigars on each side. 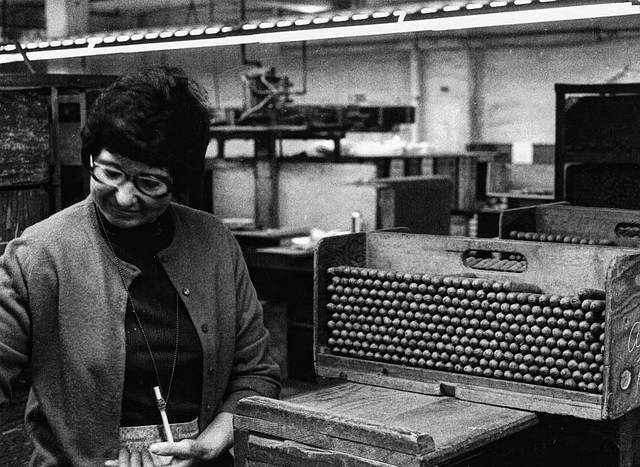 Wanda Lambert presses cigars. Note her purse next to her. The workers generally kept their purses at their stations, as there were no lockers. The business began as Deisel Cigar Co. in 1884, started by Henry Deisel Sr. He brought knowledge of hand rolling cigars with him from his native Germany. Demand increased and the company grew to include brothers Henry G. Wemmer and William J. Wemmer with a new facility at 435 N. Main St. Deisel-Wemmer Corp. added onto the building soon after. Alfred Wemmer, the nephew of Henry and William, came from Germany in 1904 and joined Deisel-Wemmer-Gilbert Co. The cigar business boomed, and more plants were started throughout northwest Ohio. Machines would replace the hand-rolling process by the early 1920s, and some plants outside Lima closed. In 1937, the company name was shortened to DWG Cigar Corp. — and the company acquired the RG Dun cigar brand. 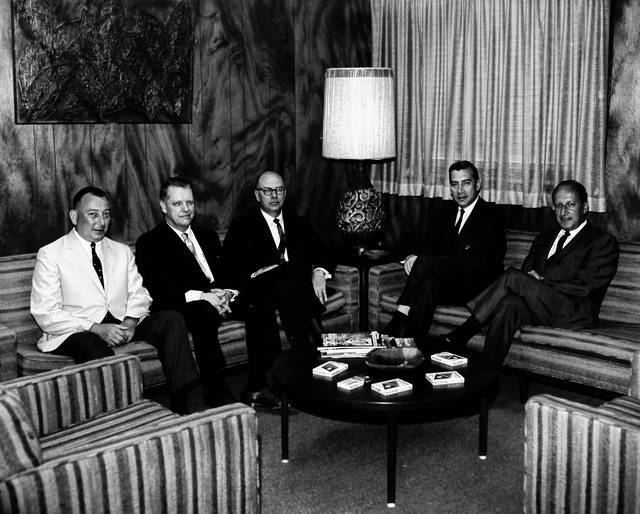 A period of buying cigar companies and brands followed, culminating in the decision to build a new plant in Lima in 1962. 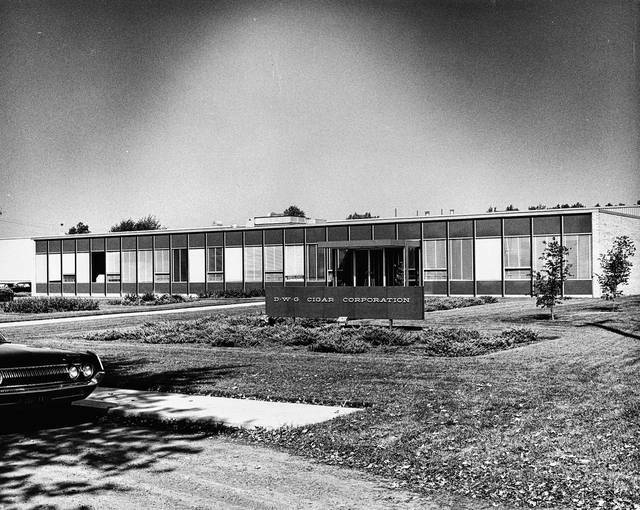 It was at 2095 Bible Road, now Dana Corp. In 1964, the surgeon general Luther L. Terry declared cigarette smoking was hazardous. In late 1964, Allegheny Pepsi-Cola Bottling Co. of Baltimore took control of the company via a stock purchase and continued a buying spree in many different types of goods, so much so that they changed names again to drop the “cigar” branding, to DWG Corp.
By 1967, they wanted to discontinue business in cigars and some saw an opportunity. 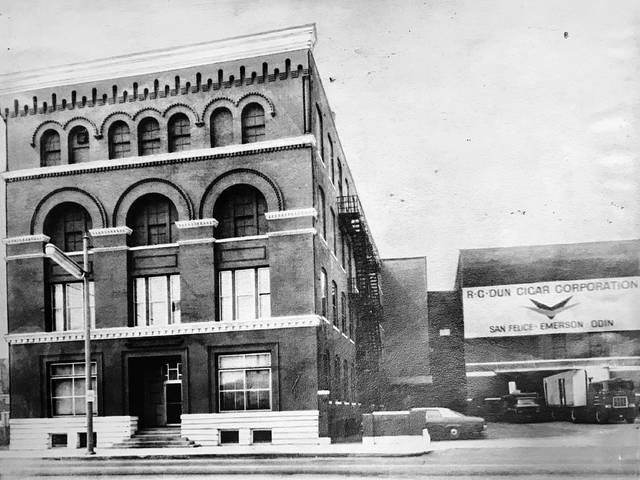 Leaders in the cigar-making industry negotiated a quick deal that split up the many brands among several companies, and one of which was the new RG Dun Cigar Corp. that would remain in Lima and continue to employ the workforce here in the Main Street building that was built by Deisel-Wemmer in the late 1800s. Lima would retain the RG Dun, San Felice, Emerson and Odin brands as well as the equipment with which to make them. Leaders saw a downturn in cigar demand and decided to diversify in the 1970s — first investing in apartments and then in distributing and catalog showrooms. Similar to Service Merchandise, a catalog showroom was opened in Northland Shopping Plaza during this era. By the 1980s, business was focused on distributing and wholesale, drawing on the company’s historical connections. The tobacco portion of the business was sold in 1990. A name change was in order, with the company divided in two — Superior Wholesale Distributors and C&M Food Services. LIMA — When Sola Curtis was in high school at Alger, she didn’t see much opportunity around her hometown of Ada besides farming potatoes or onions. That didn’t particularly appeal, so she applied where her parents worked — DWG. “I was young and wanted a paycheck,” Curtis said. She lied about her age to get in the door, turning 18 after she started working there. She enjoyed the work; she did not finish high school. Six of the 10 sisters in the family would eventually work in the cigar factory. “They all worked there a short time and left. I was the only one that stayed,” Curtis said. And stay she did. Curtis started in 1957 and retired in December 2017, taking a few months off here and there when her family grew. The company changed around her and she changed with it, reinventing itself several times to reflect what consumers wanted to buy. It began in cigars, grew perhaps too fast at times, came back under local control and diversified to continue yet today. And along the way, Curtis become friends with coworker Cheryl Wehner. Wehner started in May 1966 and retired in December 2018. She graduated from LCC in 1965. “In high school I had worked at Welles. I just wanted something a little nicer, a little better,” Wehner said. She started in payroll, earning $45 a week. Before her time there would end — like Curtis — she became good at all kinds of jobs. They exchanged knowing smiles when explaining the atmosphere. If you were good at something, they gave you more responsibility. Curtis’ jobs were wrapper layer, trainer, line supervisor, warehouse manager and vice president of operations. 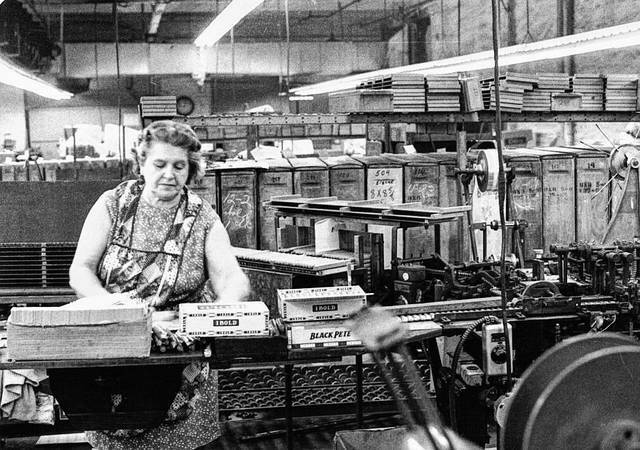 Wehner worked in the office, doing payroll, accounts payable, personnel and was eventually a buyer in the wholesale division. “They hired mostly women,” Wehner said. The company preferred hiring older women, wary of the younger woman’s penchant for getting married and quitting her job, Wehner said. The production jobs mainly went to women. “Guys didn’t want to sit,” Curtis explained. The main jobs on the floor involved sitting and operating machines. Men generally were hired to be mechanics, to keep those machines in good working order. The plant ran three shifts, with first and second shifts involving production and the third shift for maintenance. The tobacco for wrappers mostly came from Connecticut and Pennsylvania, Wehner said, and the filler tobacco arrived from the Dominican Republic, Cuba, Honduras and some domestic. 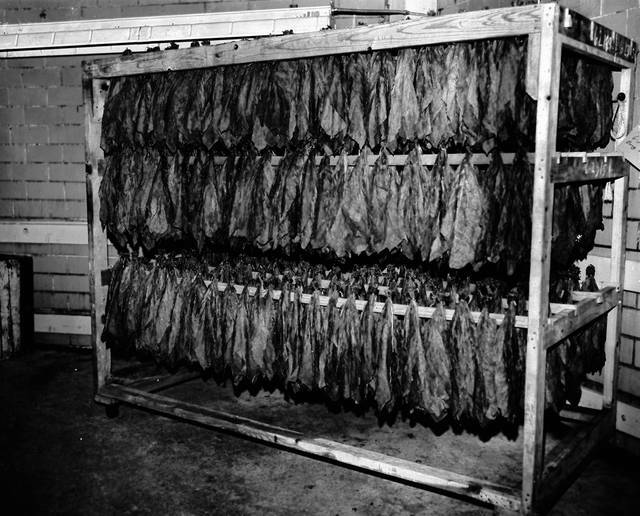 The tobacco would arrive in a dried wad, essentially, and Curtis explained workers had to rehydrate it and hang it in the conditioning room. It had a distinct odor as it hung there for a day or two. Curtis said the odor of tobacco is still present in the building even today. The hydration was needed so the leaves would be flexible. “You get used to feeling it. It has to be workable,” Curtis said. Once workable, the tobacco leaf needed to be stemmed, or stripped. The leaf had a tough stem in the middle that needed to be cut out by a machine operated by a worker. “They were called strippers. They loved that,” Wehner said with a laugh. Each leaf would have a left section and a right section, which were kept separate. 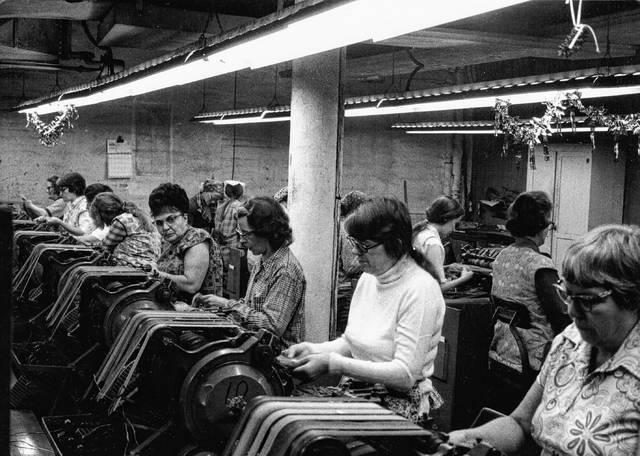 Machines were set for left or right to work with the natural curl of the leaf, Wehner said. The wrapper layer was just as it sounds — the operator who placed the wrapper leaf section into a machine that would cut it out into the proper shape. It was a kind of curlicue shape that would be wound around the cigar. The operator then set the finished cigar into a box that held 600. About 6,000 cigars were made in a day, Curtis said. The machines were numbered, Wehner said, to track the production. Old photos show women working in short sleeves. “It was very humid. We actually misted water into the air to keep the humidity up,” Wehner said. When RG Dun was being created in 1967, Wehner thought back on the atmosphere. “Everything just went on business as usual. It was very calm,” Wehner said. Both women remember Phil Porreca walking around to the workstations every day, saying good morning to everyone personally. “I guess the reason I stayed there was the people … always treated you fairly,” Curtis said. They described a family atmosphere where if one person was experiencing a rough time, everyone tried to help. “It’s really helped a lot of people over the years — and people that really needed the money,” Curtis said. During the Depression, the company cycled workers in and out so everyone would get a bit of a paycheck. “You ask why I stayed there that long? That’s why,” Wehner said. “I never smoked,” Curtis said. “Can’t stand the smell,” Wehner said, shaking her head. Reach Adrienne McGee Sterrett at 567-242-0510.